HEARTS’ new home kit has proved an instant hit with fans as over 1300 shirts were sold on the first day of its launch. After revealing the 2017-18 Umbro strip on Friday, the club have reported sales amongst the highest-ever recorded in the 24-hour period following a kit release. Hearts ran two events to mark the home kit launch. Don Cowie, Jack Hamilton and John Souttar visited the Heart of Midlothian at St Giles’ Cathedral to meet supporters and give out free shirts to competition winners. Then, the entire first-team squad attended the Clubstore from 5pm onwards to greet fans and thank them for their support. A Hearts spokesperson said: “The new home shirt is already proving to be a best-seller and we are delighted with the reaction it’s got since its reveal on Friday morning. 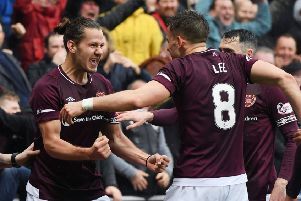 “Shirt sales of over 1300 in 24 hours is a remarkable number, yet its not surprising given the fantastic backing Hearts fans continue to give this club. “Our Clubstore has never been so busy, with fans eager to snap up the new home kit – and our first-team squad were delighted to lend a hand on Friday night.